Friends, the following are the some of important points on our honorable Prime Minister visit to Russia. 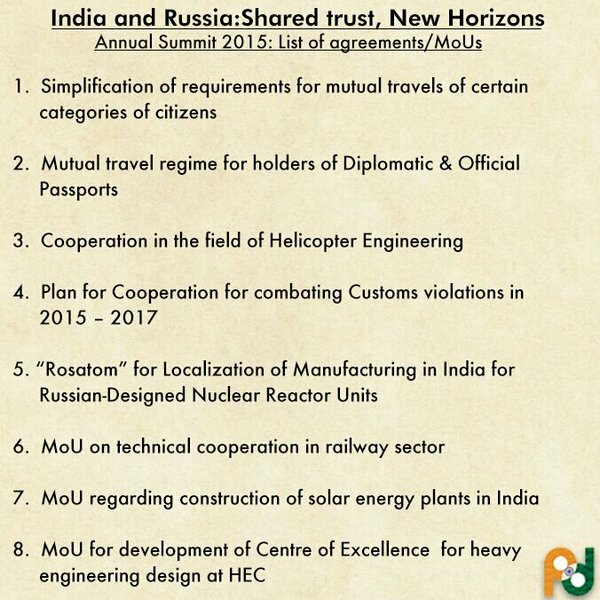 India and Russia signs agreements on specific to Energy and Defense. India tells Russia that it is more willing to modernize its armed forces and to increase its self production by Make in India projects along with initiating development of production units in India itself. 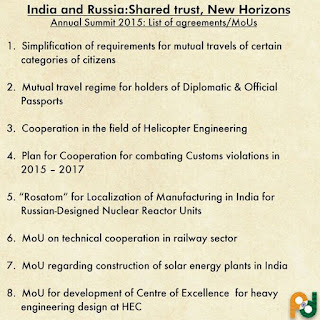 Putin said, Russian construction giants are more interested to invest in India to develop our infrastructure. Putin said Moscow believed India was "among the most honorable candidates" for permanent membership of the United Nations Security Council. Russia is willing to build another six nuclear blocks in next 20 years. This is going to be be the first large-scale project of the government's "Make in India" initiative till now. This can be considered as an initiative to other countries in invest in India for our "Make in India".